Large Pool View Balcony Terrace Dinning Spacious Condo Completely Furnished. Great Layout Fully Equipped Kitchen Master Bedroom`s Balcony Large Master Bedroom Sitting Area En-Suite Master Bathroom Large Bedrooms Second Bedroom En-Suite Bathroom Sitting Area Third Bedroom Private Balcony En-Suite Bathroom Halway Bathroom Acces Grill Areal Balcony`s View Luxurious Pool Exclusive Community Romantic Getaway. This vibrant and spacious three bedroom, three bath condo comfortably accommodates families or groups of up to 6 people and comes fully furnished with everything you could need to enjoy a luxurious, carefree vacation. Featuring a large, private dining and lounging balcony, you and your guests can experience the beauty of Jaco's renowned sunsets and sprawling beaches right from the comfort of your own unit. The open-concept living area features comfortable seating, a flat screen TV, and dining balcony access. The modern kitchen is fully equipped to meet all your cooking and entertaining needs, with full-size stainless steel appliances, granite countertops, and a large breakfast bar. Other kitchen appliances include a fridge, freezer, dishwasher, oven, toaster, blender, coffee maker and microwave. The master bedroom features a king-size bed, in-suite bathroom, chaise lounge, flat screen TV and private access to the main dining balcony. The first guest bedroom features a king-size bed, in-suite bathroom, flat screen TV and access to a private guest balcony. The second guest bedroom features a queen size bed, in-suite half-bathroom and access to a private guest balcony. Just steps down the hall from the guest rooms is another full guest bathroom and an in-suite laundry room, equipped with full size washer and dryer units. To top it all off, this unit also features plush pillows, premium linens and tasteful décor. 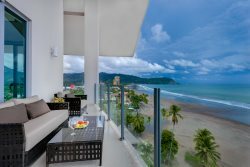 With more than just the basic amenities covered, you and your guests can leave your worries at the door of this unit and just kick back, relax and enjoy the "pura vida" lifestyle of Costa Rica!